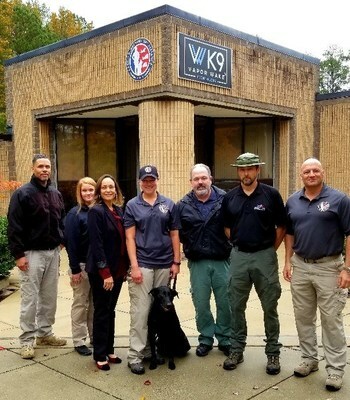 Cargo Screening K9® Alliance, LLC (CSK9) became the first commercial company to successfully certify an Explosive Detection Canine Team (EDCT) under the TSA Certified Cargo Security Program - Canine (CCSP-K9) initiative. ANNISTON, Ala., Nov. 5, 2018 /PRNewswire/ — On October 26th, TSA authorized Third Party K9 – Cargo (3PK9-C) evaluators to begin certifying canine teams to TSA standards effective November 1st, 2018. 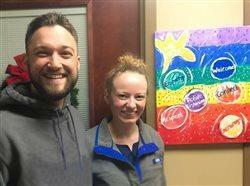 CSK9 immediately responded and requested TSA approved evaluator support from Spectrum Canine Solutions to begin EDCT certifications on the opening day. Over the past two days CSK9 EDCTs participated in a grueling certification process at its dedicated 3PK9-C testing facility located on CSK9’s 320-acre Canine Academy, in Anniston, AL. This facility, with its training and management staff, is one of four hubs that will be used to support CSK9 cargo screening operations across the nation. Today CSK9 proudly announced that Ashley Beard and her Vapor Wake® K9 Colt became the first dog team to certify under the 3PK9-C program. Ashley has been handling and training detection canines for over 10 years and will be one of the CSK9 HQ-based EDCTs available to support nationwide 3PK9 operations once the TSA CCSP-K9 is fully implemented. CSK9 will not stop here. Another 12 EDCTs are already in training and scheduled to undergo 3PK9-C certification in the coming weeks. These teams will begin screening operations at their designated worksites soon after CSK9 becomes an approved Certified Cargo Screening Facility – Canine (CCSF-K9) regulated entity. TSA established the 3PK9-C and Certified Cargo Security Program – Canine (CSSP-K9) to provide an efficient and effective method for screening air cargo to TSA standards. Under this program, 3PK9-C certified private sector canine teams can be deployed to screen air cargo for aircraft operators, foreign air carriers, and other TSA-regulated entities operating under a TSA-approved or accepted security program. As demonstrated by its quick response to the opening day 3PK9 certifications, the Cargo Screening K9® Alliance is on the leading edge of this TSA initiative and given its national footprint is well positioned and capable of meeting the cargo industry screening needs on a large scale. To learn more about Cargo Screening K9 Alliance® or to book a call or meeting contact John Johnson, CSK9 VP Operations and Strategic Development via email at 204354@email4pr.com or by phone at +1 (407) 242-7691.